Reports of trade tensions between China and the US in the past few months have been hard to ignore. In early July, the US imposed $34 billion on Chinese goods, prompting the Shenzhen Component Index, dominated by technology and consumer product stocks, to fall to its lowest point since 2014, igniting fears among investors. “The U.S. tariffs, coupled with a falling yuan, will significantly increase the cost for many Chinese technology companies that rely on imported raw materials, such as semiconductors, integrated circuits, and electric components,” Zhang Xia, an analyst for China Merchants Bank Securities, told the South China Morning Post. Additionally, the U.S. commerce department announced yesterday it will place an embargo on 44 Chinese companies—including the world’s largest surveillance equipment manufacturer Hikvision—for “acting contrary to the national interests or foreign policy of the United States.” The move caused the companies’ share prices to fall by nearly six percent. However, the focus has shifted to more than just the trade war. And a number of big Chinese tech companies have seen their share prices plummet for other reasons. Pinduoduo, China’s latest e-commerce giant to list on the Nasdaq, found that an initial public offering (IPO) is not a panacea. Conversely, its listing has drawn attention to the company’s counterfeit products. And investors are not happy. Tencent’s shares have nosedived by over 25 percent since its peak in January, erasing $143 billion in market value over the past seven months. Search giant Baidu also hasn’t been immune. The company’s stock price dropped by nearly 8 percent this week following news that Google plans to re-enter the Chinese market. While IPOs are usually a cause for celebration, Pinduoduo has proven this past week they can also be bad for business. The company—which has integrated e-commerce and social media—caters to low-income consumers living outside first and second-tier cities. It has been plagued by accusations of facilitating the sale of counterfeit low-quality goods. Just days after going public, its share price tumbled by 16 percent, falling below its offer price of $19. The drop was, in part, initiated by requests made by television maker Skyworth to remove counterfeit listings of its products from the e-commerce firm’s marketplace. The company announced (in Chinese) this week that it had removed 10.7 million listings of problematic goods. However, this did little to assuage concerns from investors and regulators after the latter launched an inquiry into Pinduoduo’s product listings. Its stock price dropped to 30 percent below its closing price on its first day of trading, wiping out over $9 billion in value. This is unlikely to be helped by the fact that seven U.S. law firms have launched investigations into the company on behalf of its investors. The statement issued by the firms shows that investors suffered financial losses after Chinese regulators began looking into the company’s dealings. The company met today with regulators and agreed to improve its products’ vetting procedures. However, it’s not only e-commerce platforms that have been affected. Video streaming service Bilibili has seen its stock price drop by almost 21 percent since July 20. The decline comes amid renewed efforts led by the Cyberspace Administration of China (CAC) to crack down on what it deems to be “vulgar” or “inappropriate” content. Baidu, which runs China’s biggest search engine, found that even unconfirmed competition can cause stocks to tumble. In a move which could mark its re-entry into the Chinese market, news broke this week that Google has plans to launch an Android app that could provide filtered results to users in China. Baidu currently commands nearly 70 percent of China’s search market. Google shut down its search engine in China in 2010 over censorship concerns, giving up access to a vast market. China’s online population now exceeds 770 million, double the entire populace of the U.S. and more than that of Europe. Baidu’s income is still highly dependant on ad revenue, which increased by 25 percent in the second quarter. 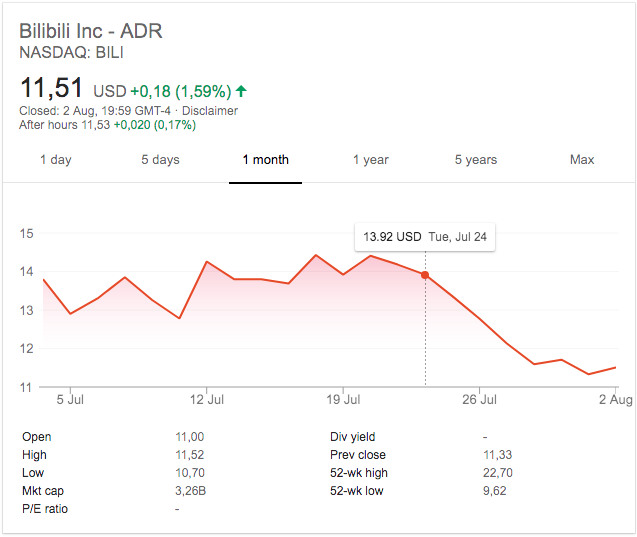 Google’s return is clearly seen as a threat, causing Baidu’s stock price to fall from $247.18 on July 31 to $226.83 on August 2. This marks the most significant fall since the company announced the departure of its chief operating officer Lu Qi in May. Nonetheless, all these losses seem insignificant in comparison to Tencent’s. The company saw its stock price increase by 114 percent in 2017, reaching a record high in January 2018. However, since then, the price has dropped by nearly $130 per share, eviscerating a considerable portion of its market value. In July alone, its stock price fell by 9.9 percent. The company’s devaluation tops Facebook’s $130 billion rout following its earnings call last month. In April, the company lost over $20 billion in value after South African investment and media firm Naspers — an early and loyal backer — announced it was trimming its stake by two percent. Additionally, Martin Lau, the company’s president, sold one million of his shares in the company. This, added to the Naspers sale and warnings of margin pressure, led to a loss of $51 billion in market value. “Investors are increasingly pricing in lower expectations for Tencent’s interim results,” Linus Yip, a strategist at First Shanghai Securities in Hong Kong, told Bloomberg. Yip expects the downward trend to continue, and not just for Tencent. “Overall, tech companies are facing a similar problem. They have been enjoying fast profit growth in the past few years, so it will be difficult for them to maintain similar growth in the future as the competition grows and some segments are saturated,” he said.